No matter how old you are, sausage rolls are always enjoyable. Well, good ones anyway! What makes a good sausage roll is the filling. These sausage rolls are made with your everyday beef mince, not fatty sausage meat, and uses lots of yummy additions to add great flavour. My favourite addition is fruit chutney. I use a great homemade mango chutney my Mum makes, but I use a good quality store bought chutney when I'm out - which works just as well. 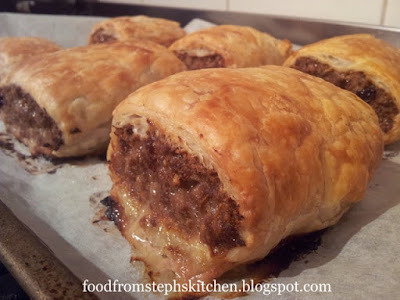 I serve these large sausage rolls for dinner, with the normal sides of mash and vege or salad. This makes them a great recipe to have up your sleeve when you have beef mince to use up. 1. Pre-heat oven to 180 C / 350 F. Grab your puff pastry sheets out of the freezer and leave on the bench to defrost. If you live in a warm climate, be careful not too leave your pastry out too long or it will be hard to use. If it's a really hot day it may be better to grab it out after you've done your filling. 2. Add all filling ingredients into a large bowl. Using your hands or a large spoon, mix until well combined and the mince no longer looks grainy but more like sausage mince (usually a couple of minutes). The more combined the mince is the better your sausage rolls will taste. 3. Divide the filling into two and add into the middle of each pastry sheet, shaping into a long log shape about the width of your thumb. 4. Fold one side of the pastry over the filling, brush with a little bit of water and then fold over the other side. Flip over the large sausage rolls so the "fold" is on the bottom. Cut into two or three large sausage rolls, depending how big you'd like your sausage rolls to be. You can also cut them into six if you'd like to use them for nibbles. 5. Add sausage rolls to a large baking tray lined with non-stick baking paper. 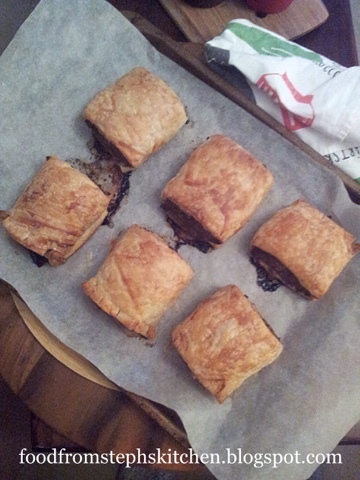 Brush each sausage roll with water and bake in the oven for 35 - 45 mins until golden brown.